Utah State University Eastern dedicates the Central Instruction Building on the Price, Utah, campus Friday, Oct. 30, at 1 p.m. with the community plus USU and state dignitaries taking part in the celebration. The $15.2 million building marks the first-major step towards a long-term campus transformation into a socially and intellectually vibrant higher education campus, said Method Studio’s principal architect Joe Smith. “The facility consists of interior and exterior gathering spaces intended to serve the community, students and faculty alike. The floor plan provides fluid circulation paths that are intended to invite curious meandering and foster interaction between faculty and student. “The CIB is uniquely located where the heart of campus and the community intersect and is envisioned as a device to support a welcoming union between these two essential environments. The project enhances connections to the historic Geary Theater and Reeves building and reinforces an evolving image for campus,” Smith said. The common thread of connecting USU Eastern to the community and the community connecting to the university was architect’s Shawn Benjamin’s thought process when he visualized the completed CIB. Chancellor [Joe] Peterson requested a building that could invite the community to the university and make the community part of the university. He wanted a different image, not a building of pure function, Benjamin said. Music, theatre, visual and fine arts, communications and criminal justice programs are housed in the 58,000-square-foot facility. The theater department will use the CIB’s Peterson Black Box Theater, a completely black theater room with advanced LED lighting and sound technology, during the renovation of the campus’ historic Geary Theater for the next two years. The new Gallery East incorporates all-natural lighting to display art from artists throughout the United States with art students able take advantage of new art studios for ceramics, wood and 2-D art. Criminal justice and the recently added law enforcement POST academy will make use of a classroom and labs designed for safety and easy clean up while conducting forensic tests. A new crime scene lab is included in the building, allowing instructors to setup real life indoor and outdoor crime scenes, allowing students to participate in everything from tire track testing to evidence collection and management. The communication/newspaper lab is a state-of-art facility hosting The Eagle newspaper students, complete with a think tank. Video and communications technology are heavily featured in all the classrooms, allowing students to interact with both instructors on campus and instructors broadcasting classes from other campuses. The classrooms allow Price campus instructors to broadcast classes to other campuses. The criminal justice students in the USU system, including those in Logan, receive all of their courses broadcast from Price. The architects of the CIB specified materials that showed strength like the cement, steel and wood interiors and exteriors, because they felt it reflects what has gone on before and embraces what it means to move forward. Each material takes on different meanings as one walks through the wide corridors. Community involvement is also a major theme in the CIB. 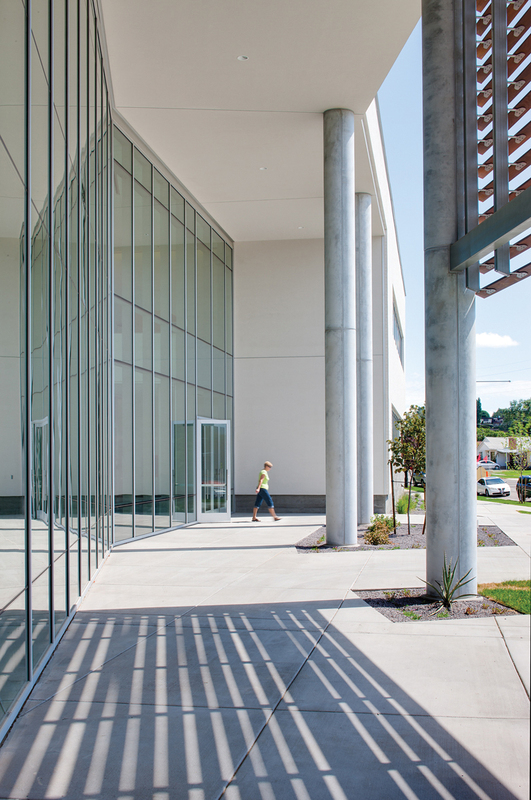 The large glass façade on the front of the building is purposefully designed to allow the community to see inside the building and have the academic programs on display. A small outdoor amphitheater and sculpture are located in front of the building to serve as a venue for public events, adding to the relationship between the university and the community. After the ribbon cutting at 1 p.m., tours and information about the building are available. Several of the academic departments housed in the CIB will demonstrate how the facilities improve the academic experience for students. Light refreshments will be served. The dedication, ribbon cutting and following activities are open to the public.